Follow the link to retrieve requested pagelink. Speed may vary. Islamic Republic agents acted as tax investigator took Madame Shirin Ebadi's law office computer cases with them! Madame Shirin Ebadi is the president of the " Centre for Human Rights Defenders " in Iran. On Monday December 29, 2008 at 5:30 pm five person with a letter introduced themselves as tax agents entered into the law office of madame Shirin Ebadi the Noble Peace Priz winner and took with them two computer cases of her law office . In recent past plain cloths agents attacked on office of the "Centre for Human Rights Defenders " in Tehran and sealed the office. Mehr news agency reported that: "Tax investigation agents of the city of Tehran several time attended in the law office of Madame Ebadi for investigation and she refused to cooperate with them." Mehr news agency in its report said : "Shirin Ebadi has Tax problem" . Shirin Ebadi has rejected for having tax problem. "Three tax agents together with one judiciary representative on Monday December 22 came to my law office and did an investigation. It is for more than 15 years that i do work for my clients for free of charge. And i defend prisoners based on their openion and political belief ." She said: "The atax agents can easily verify the income of the lawyers through -stamp notebook- therefore they can find out about all my client case files." Islamic Republic regime in Iran lives & breath by creating crisis. Just to take away the attention of ordinary citizens from the real problems they face , regime create "a smoking gun " . Although This policies are too old but still works in deceiving ordinary citizens but for a while and not for all the time. Sometimes ;"the smoking gun" is nuclear issue, other time tough talk of war , sometimes ; a bomb explode somewhere in the country ,other time rumoures that Khamenei is sick , sometimes the issue of Hezbullah in Lebanon comes to aid , other time the Hamas . Despite of all , the increasing movement for human rights, civil rights not only in Iran but also in the whole region of Middle East is growing bigger than the " smoking gun ". Sooner or later the tidal wave of a "united human rights for all" is coming. Increasing fear of the Islamic Republic regime in Iran from a united human rights movement has increased arrest and imprisonment of workers, women,student, teachers, ......rights activists! Latest news indicates, that regime has arrested Mr. Ebrahim Madadi the vice president of the Bus transit workers. Mr. Madadi was arrested by plain cloths agents at 2pm on Saturday and was transfered to an unknown location. Members of the "Bus Transit Workers Syndicate" have followed the case but was unable to find any information and lead. Shahnaz Gholami the journalist and women's rights advocate started her hunger strike in Tabriz city prison! Ms. Gholami was arrested on Sunday November 9, 2008 in the city of Tabriz. In protest to her prison condition( She has been kept in murderers, drug dealers and prostitute ward), she has started the hunger strike since December 19,2008. Ms. Gholami is a journalist and manager of " Azarzan " ( Women of Azarbayjan) weblog. On September 23 this year she was sentenced to six months imprisonment by Tabriz city court of revolution. She was charged with " propagating against the Islamic system". She was released on bail and was waiting for superior review court result . In the past Ms. Shahnaz Gholami spent five years in prison (from 1989-1994). She also spent one month in detention in other occasion. Like many other human rights advocates ,journalists, writers ....she is also not allowed to leave the country. 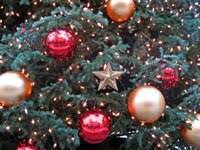 Merry Christmas and Happy Holidays to all ! 2-Shirin Ebadi in front of the office of " Centre for Human Rights Defenders"
Praise be to god,today in Iran most defense is about the human rights! in principle, who better than you defends the human rights . Don't be deceived by these words. Praise be to god,today in Iran most defense is about the human rights and unfortunately those individuals that are against the human , Islamic and humanity values are talking about this slogan and God forbid you musn't be deceived by these words." Iran's Writers Association in a communique condemned the arrest of Mohsen Hakimi one of its member ! According to information, Mr. Mohsen Hakimi member of Iran's Writers Association is arrested by the security agents on December 22, 2008 when he visited one of his family friend. This arrest happened while there was no cases or charges against him.
" Iran's Writers Association condemns this arbiterary arrest and demands for immediate and unconditional release of Mr. Mohsen Hakimi." says the communique. Mr. Hakimi was arrested in the past,he has written more than 10 books and is a prominant writer and translator . He is also a labor activist . Islamic Republic can't be trusted , saying one thing and doing another! Mr. Mohammad Sedigh Kabudvand founder of the organization of human rights in Kurdistan is sentenced to 10 years in prison by the Islamic Republic regime in Iran . This is happening in Iran ,while in 1998 the Islamic Republic together with other countries(member of the UN)has approved a UN communique to protect the human rights defenders in their countries. Growing tension between workers and the Islamic Republic regime in Iran ! Iranian workers for human rights! A group of metal factory workers (number 2) in protest gathered in front of their management office near "Saei Park" and demanded their unpaid salary and benefits for the last six years be paid. According to one of the worker, the number of workers in this factory because of delay in payment & benefits has decreased from 1500 worker to 300 . Islamic Republic with their action against "Association of Human Rights Defenders" is testing UN , EU and all human rights defenders around the world . 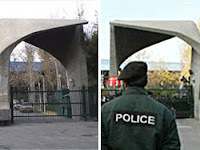 Office of the "Association of Human Rights Defenders" in Iran is sealed by security agents! On Sunday security agents and police forces attacked on the "Association of Human Rights Defenders" office in Yusef Abad Street in Tehran and sealed the office. Ms. Narges Mohammadi the spoksperson for the Association of Human Rights Defenders said: "The police forces, agents of the police station and plain cloths agents arrived at 3 :00pm and without showing the court order entered into the building. Around 10-15 people entered into the building and made video recording. " According to Ms. Narges Mohammadi , On Sunday the "Association of Human Rights Defenders" in Iran were planning to celebrate the 60th anniversay of the declaration of human rights. Students after Student's Day protest in Iran! I remember when i was student in Phillippines and because of writting just a short critical news against security guards in the campus , i was black listed ,could not enrol and later was called in security office and the head of securities threatened me of expulsion not only from university but also from the phillippines( a diciplinary measure). A few years later, the government of dictator F. Marcos was overthrowned. Phillippine's Students movement played very important role in defeating his corrupt government. Now its the story of Iranian student and the regime of the Islamic Republic. Amirkabir newsletter have reported that; following the summon of 16 students from Shiraz University during last week , on Saturday December 20 another 19 students were summoned to diciplinary committee. All these students are accused of participating in student's Day rally and of course the list doesn't end here. Iranian and International human rights group are worried about the health and prison condition of Farzad Kamangar ( Kurdish teacher) & Mohammad Sadigh Kabudvand (journalist)! United Nation: The government in Iran is " violator of Human Rights" ! Finally in December 19, 2008 the General Assembly of the United Nation with 69 Yes vote and 54 No vote released a resolution and expressed its deep concern about the violation of human rights in Iran. Torture, widspread execution, child execution, trial of women rights activists , discrimination against ethnic Iranian and harrassment of minority groups including Bahai's. Those 54 states ?????? !!!!!
" Nimrooz" weekly was to be published , its liscence was cancelled by Ahmadinejad's government! Nimrooz was going to be published with Mohammad Ghoochani as its editor in chief and the rest of the team of weekly " Shahrvand Emrooz " which was banned after a speech by syed Ali Khamenei. It is hard for those who are critical to the policy of government to receive liscence permission for publication. Behind all this scenario is the Ministry of Guidance and Mr. Safar Harandi the Minister of Guidance & the government of Ahmadinejad. UN and EU must take stronger measure against Islamic Republic on Violation of human rights! Mr. Omid Reza Mirsayafi "Rooznegar" weblog writer is sentenced to two and a half years imprisonment! He has been accused for insulting the officials and propagating against the Islamic Republic. He has an open case file "insulting to holy or sacred thing". Judge Salavati the head of the branch # 15 of the court of revolution sentenced Mr. Mirsayafi to two and a half years imprisonment for insulting Khomeini and Khamenei. Mr. Mirsayafi was arrested in his home on April 22, 2008 and was transfered to ward # 209 in Evin prison and after spending 41 days in detention was released on a bail of 100 million Tuman ( almost 100,000). 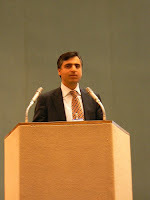 Mr. Mirsayafi was writing cultural issues in "Rooznegar" weblog. 20 October 2008 – Secretary-General Ban Ki-moon expressed his concern over the rights of women and minorities in Iran, as well as over the death penalty, including juvenile executions and stoning, in a new report to the General Assembly on the country’s human rights situation. He pointed to the limited employment outside of the agricultural sector for women and to “widespread” gender-based violence. Further, stepped-up crackdowns against the women’s rights movement in Iran is also cause for concern. The country’s constitution explicitly states Islam to be the State religion, but includes provisions for religious minorities. 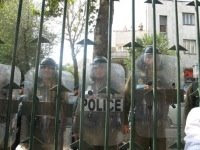 The Secretary-General said that there continue to be reports of members of the Baha’i community facing arbitrary detention, false imprisonment, confiscation and destruction of property, denial of employment and Government benefits and denial of access to higher education. “A significant increase has been reported in violence targeting Baha’is and their homes, shops, farms and cemeteries throughout the country,” he wrote, adding that there have been several cases of torture and ill-treatment of the group in custody. Despite a circular issued by the head of the judiciary in January 2002 prohibiting stoning as punishment, the practice has been reported to continue. In another non-binding circular, the judiciary has placed a moratorium on juvenile executions, but the sentences are still being applied, Mr. Ban said. Iran is a party to the International Covenant on Civil and Political Rights (ICCPR) and to the Convention on the Rights of the Child, both of which obligate States parties to not impose the death penalty on those who commit crimes under the age of 18. “The age for criminal responsibility under Iranian law is set at 14 years and 7 months for boys and 8 years and 9 months for girls, which is not only discriminatory but also low by international standards,” the report said. The new publication urged Iran to continue revising national laws, particularly the new Penal Code and juvenile justice law to bring them in line with international human rights standards. It also welcomes steps the country has taken to explore cooperation on human rights and justice reform with the United Nations. Two independent United Nations experts on human rights issues today voiced deep concern over the Iranian Government's increasingly severe crackdown on advocates of the rights of women in recent years. Defenders of the rights of women are facing a progressively difficult situation, including harassment and intimidation in the course of their non-violent activities, the two UN Special Rapporteurs said in a joint statement. “Peaceful demonstrators have been arrested, detained and persecuted with prison sentences having been imposed on many of them,” said Margaret Sekaggya, Special Rapporteur on the situation of human rights defenders and Yakin Ertürk, Special Rapporteur on violence against women, its causes and consequences. Men and women involved in the One Million Signatures Demanding Changes to Discriminatory Laws campaign have been particularly targeted, according to the two experts. The campaigners aim to collect one million signatures from Iranians demanding the revision and reform of current laws which discriminate against women, such as those regulating marriage practices, divorce, criminal acts, and inheritance rights. “To date, 18 communications have been sent to the Iranian authorities concerning violations committed against over 70 human rights defenders involved in the campaign, and on 5 April 2007 a press release was issued on the situation,” said Ms. Sekaggya and Ms. Ertürk. “Until now, we have received only three responses from the Government,” they added. In their joint statement, the Rapporteurs urged the Government “to abide by its obligations under the International Covenant on Civil and Political Rights and the International Convention on the Elimination of all forms of Discrimination against Women, and respect the rights of women's rights activists to freedom of association and peaceful assembly, and to freedom of opinion and expression”. On November 1st, the controversial Canadian-Iranian weblogger Hossein Derakhshan was arrested in Tehran by agents of the judiciary. They were acting on orders of the notorious prosecutor-general Saeed Mortazavi, implicated in the torture and murder of Canadian-Iranian photojournalist Zahra Kazemi in July 2003. The arrest has created a predicament and challenge for the Canadian government as well as democratic forces in the Canadian-Iranian diaspora. Since President Ahmadinejad's reign in 2005, the self-styled "blogfather" who once championed the reformist cause in cyberspace had turned his talents to defamation of human rights advocates and anti-Western propaganda. It is now up to those he mercilessly defamed to ensure that he doesn't meet a tragic fate similar to Kazemi.During the reformist period under President Khatami, Derakhshan was one of many young Iranians who promoted democratic reforms in the blogosphere. Some credit him with making Persian-language blogs one of the most prolific in cyberspace. Derakhshan even visited Israel on his Canadian passport in order to promote "people to people" dialogue among adversaries. Despite this commendable record, at one point he became a leading apologist for President Ahmadinejad, referring to him approvingly as the reincarnation of Ayatollah Khomeini's "revolutionary" spirit. In a campaign perceived by many as an opportunistic volte face, he spent considerable effort defaming Iranian human rights advocates, portraying them as traitors and enemies of the Iranian people.I was one of the targets of Derakhshan's hate campaign. 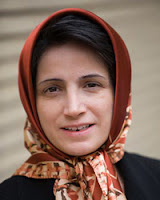 In one of his postings, he claimed that the celebrated Iranian human rights lawyer and Nobel Prize laureate Shirin Ebadi should instead receive the "Hypocrisy Award" because she had allowed her daughter to study under my supervision at McGill University, and I was allegedly an American agent for having founded the Iran Human Rights Documentation Centre in New Haven, Connecticut together with former colleagues at Yale University. In another posting he claimed that the "confession" of arrested University of Toronto professor Ramin Jahanbegloo that his research fellowship at the U.S. National Endowment for Democracy was part of a CIA conspiracy to foment a "velvet revolution" in Iran was a genuine admission and not a statement made under duress. When the Canadian government appointed me to the Board of Directors of the International Centre for Human Rights & Democracy in March of this year, he claimed that this was a continuation of the U.S. conspiracy insofar as this organization had awarded Canada's most prestigious John Humphrey Freedom Award to Iranian dissident Akbar Ganji, who he also portrayed as an American agent.Given his recent role as apologist for President Ahmadinejad and his systematic defamation of human rights dissidents, Derakhshan may have assumed that he would be safe when he returned to Iran after spending several years in Toronto and London. 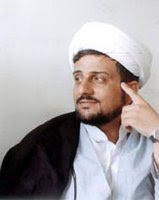 Despite his family's ties to influential figures in the Islamic Republic, certain hardline elements have apparently not forgotten his earlier criticism of the Supreme Leader Ayatollah Khamanei and recognized his potential value as yet another source of "confessions" confirming the foreign conspiracy theories that the regime regularly invokes to buttress its role as guardian of the revolution. It is a cause for serious concern however, that there has been no news whatsoever as to his place or condition of detention for the past two weeks. Given the appalling record of Iran's judiciary in torture and "accidental" deaths in custody, it is reasonable to surmise that Derakhshan may be in serious danger.Those human rights advocates that he worked so hard to demonize, myself included, must now transcend his treacherous politics and defend his fundamental rights, both because he is a fellow Canadian citizen, and more fundamentally, because he is a human being. The litmus test of human rights is the inherent dignity of all and not political convenience. Derakhshan's vilified enemies may yet become his saviours in his darkest hour. Payam Akhavan is Professor of International Law at McGill University in Montreal, a former UN war crimes prosecutor at The Hague, and Co-Founder of the Iran Human Rights Documentation Centre. Feminism is Our identity ! She said : " All these women strife to bring change in legal and social condition of women. They are women rights activists . They have been deprived from a fair trial . ...For me, those who live in Tehran, Marivan, Sanandaj, Zahedan, Zabol, Ahwaz , Tabriz , Isfahan or Kerman.... city are part of Iran and they are our fellow citizen and therefore supporting and defending human rights activists and women rights activists in these regions is part of our natural support for a fellow citizen.Our relation is sisterly and not political relation. Feminism is our identity and we do not have any other identity." Women continue their fight back for Human rights and Democracy in Iran! 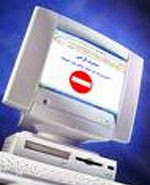 Islamic Republic in Iran continue its onslught on weblogs with more filtering! 1-Madreseh Feministy ( School of Feminism ) - This site has been filtered for eight times. 2-Tagheer baraye Barabary ( Change for equality )- This site has been filtered for 18th times. 3-In less than two weeks ago many websites of " Campaign for One Million Signature " in the city of Hamadan, Azarbayejan, Zahedan, Shiraz, Mashhad, Kuwait , Germany, Zabol, Amol, Ilam, Kermanshah, Rasht, Karaj, Arak, California, Cyprus, Sweden. Zhila is a journalist and member of the "Campaign for one million signature" . Zhila was writing in her website for four months. She started writing reports about the events in university campus and one of her last article was titled as " Those 400 People " , a report about the 7th day of the death of Said Emami ( One of the leading figure from Ministry of Information of the Islamic Republic )- Said Emami known also as Islami was behind the "chain murdering" . For more information please read IWC . December 10/2008 is the 60th anniverasary of the International Human Rights Day. Keep the charter of rights booklet in your pocket at all time and defend your rights. Dont let anyone to violate your rights. Be a human rights advocate wherever you are. Nasrin Sotudeh a brave Iranian lawyer of the "campaign for one million signature" is banned from leaving the country ! Three Bahai's went on trial in the city of Yasuj ! Because of teaching Bahai's literature to kindergarten student; these people have been accused of propagating against Islamic Republic. The names of these threee Bahai's are : Rohieh Yazdani, Zoleykha Musavi and Ali Askar Ravanbakhsh. On November 23 this year they attended in Yasuj Islamic court of revoluion and were sentenced to imprisonment. In total , they have been sentenced to four years imprisonment. Since their arrest until now, they have spent two months in Yasuj temporary prison centre. Ms. Rohieh Yazdani who is an educational coach for childeren, created free painting,moral and educational pre-school classes for childeren from the age of 5-7 in Mehraban village nearby Yasuj city in the province of Kohkiluyeh and Buyerahmad. Zoleykha Musavi and her husband Mr. Ali Askar Ravanbakhsh are also accused of providing their home to Rohieh Yazdani for the above educational purposes. There were 70 pre-school student in the class using this program for free. Student chanted: Death to dictator , shame on you police force! TEHRAN: Iranian students held a protest Sunday at Tehran University calling for freedom and denouncing the policies of President Mahmoud Ahmadinejad, a pro-reform student group said. The protest amid heavy security was organized by the radical pro-reform Office to Consolidate Unity (OCU) student group to mark National Student Day. "There was tough control, they [authorities] would not let anyone in but students broke the gate and came in," OCU member Mehdi Arabshahi told AFP. "A lot of protests were directed at Ahmadinejad over oppression in universities and the bad economy," he added. "The protesters also demanded academic freedom and respect for human rights." According to him "thousands of students from different universities were there" for the two-hour protest, which started at noon. National Student Day is observed on December 6 but student sources said they had decided to hold the protest one day late in order to avoid official ceremonies. Iran's Fars news agency, which is close to conservatives, said that only 150 demonstrators took part in the protest. The agency described the protesters as "anarchists" who shouted "extremist slogans" and said that they broke the windows of the university's security office and threw rocks at wardens. Iran's supreme leader, Ayatollah Ali Khamenei, had been reportedly due to speak at Tehran's Science and Industry University on Saturday but the event did not take place. Iranian universities are hotbeds of student activism and protests are common despite strict control on campus since Ahmadinejad came to power in 2005. Scores of pro-reform student activists have been detained over the past two years and many students have also been barred from universities over their activism, rights groups have said. University students cry for all these injustice ! Early report indicate about the fear of oppressive Islamic Republic regime on students rally in commemorating the Student Day (December 6 each year) in Iran which took place for the last 55 years. Regime chose to use its security and police forces against student voice of free will. This protest in general may ..I say may be in question ? because Iranian Student movement is stronger than what has been said by this student and because of regim's fear from student movement , this gathering may be was a planned gathering and .....may be i'm wrong and this event was a genuine one. Tomorrow Sunday the student all over Iran are going to protest. Posters by : "Iran's Writers Association "
Come closer ! Eventhough your participation is forbiden. No to Censorship , Yes to freedom of Expression ! 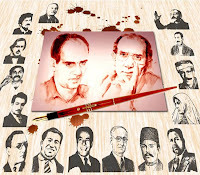 10th Murder anniversary of Mohammad Mokhtari and Mohammad Jafar Puyandeh , the two Iranian writer and members of "Iran's Writers Association" by the Islamic Republic's Ministry of Information.Iran's Writers Association chose December 3 as a day against censorship in Iran. Students all over Iran prepare themselves for honoring the Students Day in Iran ! Sunday December 7/ 08 student are gathering in Tehran University. University , cry for freedom ! This gathering will start @ 12:00 pm Sunday . Regime prepare itself for security measures. 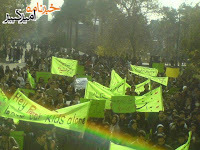 The students prepare themselves for honoring the Students Day ( December 6 in Iran). Four years imprisonment for Mojtaba Lotfi! The special clerical court of the city of Qom , sentenced Mr. Mojtaba Lotfi to four years imprisonment and five years internal exile.Mr. Lotfi wrote articles in banned reformists newspaper such as " Khordad", " Fath" , weekly magazin " Awa" . His writing were also posted on bloggers of the city of Qom. Mr. Lotfi was also arrested in the city of Qom in 2004 and spent 2.5 months in solitary confinement. The special clerical court of the city of Qom has arrested Mr. Lotfi since October 8/2008 . At the time of arrest Mr. Lotfi acted as one of the communication secretary in the office of Ayatollah Montazeri .